‘The Power of Now’ was one of the most favorite sayings of my first manager. A simple one but effective enough that you should know & adopt. It was social media marketing then…but now the crown has passed on to Artificial intelligence. Artificial Intelligence which once was part of science fiction novels is now a reality & is influencing the business world in the most amazing ways. To put it simply, Artificial intelligence is the process of permeating machines with “intelligence” to make them mimic the unique abilities of human beings which include reasoning faculties, skill to learn, plan & decide. The process is achieved by using algorithms that identifies patterns to generate insights for applying in future decision-making & predictions. Currently these sidesteps need to be reprogrammed for single possible action. B2B enterprises around the world are implementing Artificial intelligence for accelerating their growth & revenues in the past 10 years. In fact, B2B professionals believe that Artificial intelligence will revolutionize the field by the year 2020. 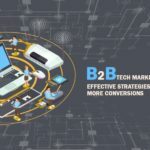 The buzz that’s going around Artificial intelligence influencing B2B sales is huge but what can confuse is in identifying in what all aspects it can work together with human-driven processes. Especially with all the data, marketing tools, analytics software & marketing technology software out there, tracking & integrating all this in the best way is becoming increasingly complicated. Forecasting is one the most challenging as well as a critical task for any sales team. One of the major key data points that’s made used while constructing a forecasting is the placement & movement of the stage of a sales deal. But the reality that marketers have to understand is that the sales stage placement & movement often falls under the discretion of the sales executive. Making use of artificial intelligence, organizations can add a systematic validation to sales stage categorization & can layer objectivity on to the subjectivity of the sales executive. Artificial intelligence powered sales forecasting collects data from past deals-both lost & won. It analyze all the data collected to see how they relate to the sales outcomes. The insights are then are applied to the current pipeline where the software scores deals, provides visibility to them & even advises the sales executives on taking the next actions. The best artificial intelligence software can go back & reconcile accuracy rates, in order to learn from past successes and failures. All this makes the process game-changing. At glance you may not notice hoe artificial intelligence plays the part in lead generation processes but by diving a little deeper you’ll see that artificial intelligence can aid amazingly in identifying more leads. Artificial intelligence makes it easier in filtering the massive databases & discovering the leads that are most relevant. Majority AI lead-generation platforms allows marketers to set specific parameters. Quickly identifying qualified leads enables to pair your interactive marketing with outbound marketing which can also be boosted with artificial intelligence. Computer learning can create algorithms based on the emails, text, contact lists & phone call log & the information from each interaction can act as a new marketing insights including selecting the ideal channel for communicating with each type of lead. Successful marketers around the world have already started applying artificial intelligence in both of their outbound & inbound marketing strategies. By making use of NLP techniques in artificial intelligence, large amount of data can be captured throughout the pursuit which makes it easier for sales managers to gain additional insights. Artificial intelligence makes it easier in analyzing human language from CRM, marketing automation & social media channels. This approach is more data informed & can take many forms; from Predictive analysis models in identifying the weaker leads in the buying process to search driven analytics to explore customer data to speech analytics to identify the insights from the conversations between sales reps & new leads. Without artificial intelligence the work is tedious, manual, error-prone & sometimes impossible. Social selling before artificial intelligence was just trying to pick targets, trying to connect with them, then try to connect & interact with them by leaving unsolicited validation to build rapport before trying to pitch the product. Artificial intelligence can tap into billions of data points from your existing database, as well as social media networks & external data that’s crowdsourced to make accurate predictions about the social buyers. This makes it easier to get to the right leads faster which is the most important step in the sales process. Artificial intelligence also makes the predictions on when sales opportunities will close more accurate. This enables the sales reps to manage opportunities from conversion to closing & in taking the right steps to making progress on a deal. Artificial intelligence also aid in personalizing the outreach to each persona with customizable templates for different verticals, products or personas. It’s a sad fact that salespeople spend too much of their time on monotonous tasks such as cold-calling, responding to emails etc. As stated by McKinsey Global Institute, artificial intelligence can automate 40% of the time spent on these menial tasks by embedding into CRM databases, Salesforce automation software & other B2B applications. Artificial intelligence can free salespeople from monotonous tasks & the positive effects of this method are far reaching & can uplift B2B marketing to new heights. These are just few of the applications where artificial intelligence can aid in B2B sales. But most of the time marketers make the mistake of not identifying how the effectiveness of the artificial intelligence can be upgraded to its full potential. Precise data is crucial for all sales & marketing functions. But marketing data decays 30% every year due to multiple reasons in addition to simple errors, bias, and duplications. As automation software becomes machine learning & when it starts to feed on artificial intelligence, inaccuracy & errors move downstream & infect entire decision crafting systems. It’s very much crucial to gather robust amounts of data for sales & marketing systems because if datasets are too small, irregularities and differences can appear which can lead to incorrect conclusions. The success of artificial intelligence & machine learning platforms is entirely dependent on both the quality & quantity of the datasets being used to train them. Day by day companies are getting better at data collection but still we struggle in finding context & interpret actionable insights. This is where the magic human touch comes into play. How much ever intelligence the software acquires it’ll still be seeing in ones & zeroes & that’s what makes the human experts who engineer, refine, and augment data- important maybe more than the algorithms. The day when data integration is so good, when our algorithms are so forward, that creating meaning becomes a simple AI function – but not today in the B2B world. Until then, artificial intelligence can work along with sales, marketing, and other business departments, providing predictions based on analytics & requiring feedback from humanity in return for filtration & deciphering. It’s hard even for experts to fully understand how B2B sales culture will be impacted by being powered with Artificial intelligence. Primarily because whatever that’s been achieved is just the tip of the iceberg. There’s a lot more that should be covered which will require time & effort. At present all the practical use case studies recommend that Artificial intelligence & machine learning can aid to manage the violent flow of data to generate real time predictive models & efficiently engage with customers and acquiring competitive advantage at the same time. What you have to do is to ensure that everyone in your company is devoted to supporting the artificial intelligence system including your sales reps who should take extra care in doing artificial intelligence recommended actions. These are the initial steps in making sure that the system & the artificial intelligence driven sources are being observed to safeguard success. Metadescription: Artificial intelligence has changed the way we do B2B sales in ways which were only part of science fiction novels. Given its amazing potential, it’s already transforming the way people are interacting with brands. Read on & learn more on the concepts of Artificial intelligence in B2B sales.